Invited by Dr. Alberto Guevara, the editor-in-chief of inTension journal of York University, virtual reality project Land of Illusion by Lily & Honglei Art Studio (currently with three active members, Xiying Yang, Honglei Li and He Li) will be published in the next issue of this academic journal. Issues of the journal are theme-based, but space is provided in each issue for articles, reviews, and artwork that engage the core interests of InTensions: the theatricality of power, corporealities of structural violence, and sensory regimes. InTensions is now accepting proposals for guest edited issues. Please contact Alberto Guevara or Elysée Nouvet. To play is human. Play is a social act of often unclear boundaries. The delineation of playing as a special conditional form of doing or acting in the world relies upon registers of seriousness, authenticity, consequence and import, yet these registers are ultimately ambiguous. Play can materialize and relativize banal affective and social relations. Play can imagine, insist on the possibility of, or suppress, difference. Play may provoke shock or distraction, conceal or reveal intention. Play may be encouraged or denied, rewarded or punished, feared, disdained, addictive, fatal. What becomes possible as a result of play in specific contexts? What socio-cultural relations are inscribed in the various sites of play? Are there limits to the social power of play, or limits to the social contexts in which playful acts may be asserted? Or is the very delineation of some actions as play itself a limit on imagination and transformation? To what extent do the connotative associations of theatre, sport, or childhood constitute a limit on what is considered play? What is the role of play in science, industry, politics, or war? What associations are can be traced between play and inductive, exploratory, or experimental knowledge generation? Developmental theories situate play in the process of accommodating to reality, whereby the child first assimilates difficult and incongruous aspects of reality by revisiting them with familiar schema. For Baudrillard, the reproduction of the ‘real’ risks eclipsing its truth-value. These positions inscribe a vast territory populated by varying admixtures of representation and awe. Is play necessarily reactionary if it is absorbed into the normative and normalizing practices of (re)production and consumption (Debord)? When are play and playfulness critical distractions to organized protest? Alternatively, how might simulation and virtual worlds unleash important re-imaginings and re-mappings of the social (Deleuze)? What are the unique potentialities of play when engaged as formative, preliminary, inconsequential, non-serious, speculative, or exploratory? In this issue, we invite scholarly/artistic contributions that engage the relations between play, power, and social reproduction. We welcome theoretical explorations, as well as reflections, experiments, reports, or ethnographies on play and playfulness in its lived, historical, and cultural contexts. Still image of Milky Way, by Lily & Honglei Art Studio. An ancient folklore has become reality in present-day China. The tale of the Weaving Maiden and the Buffalo Herder is known to practically every segment of the Chinese population. The narrative, which roots could be traced back thousands of years, revolves around a romance between the two namesake characters. The Weaving Maiden, a deity of the traditional Chinese pantheon, comes down to Earth and falls in love with the poor mortal Buffalo Herder. They marry in secret, transgressing against the boundary set between the human and the divine. When this serious offence is discovered by the Maiden’s mother, the chief goddess of Chinese folk religion, tragedy becomes inevitable. The mother calls her daughter back to the celestial realms, intending to undo the forbidden relationship. The Buffalo Herder, though, does not relinquish his love with such ease; he tries to reunite his family by sneaking into heaven with his two children. The plan is nonetheless foiled when the mother goddess draws a line in the sky, dividing the husband and the wife. The line becomes a river as deep waters gushes in and pushes through the heavenly nether. Their love, though, finds a glimpse of respite when the mother decrees that they may reunite for one night each year. Only on the seventh night of the seventh month on the Chinese lunar calendar were the mythical lovers allowed to seek each other’s company. Such a tragedy is crystallized in the saga of Chinese astrology: the constellation Altair represents the Buffalo Herder while Vega is likened to the weaving maiden. The Milky Way is the celestial river which separates them. As fancifully heartbreaking as the story is, it is undoubtedly more tragic that the tale has become reality for rural families in contemporary China. The traditional lifestyle of the agrarian population has been destroyed by the economic development that has been taking place over the past few decades. In order to fulfill their basic needs of living, hundreds of millions of rural people have poured into cities as migrant workers. True to the folklore, families have been separated and have no means of reuniting except for a day or two each year during the traditional Spring Festival. Such separation has not only brought dread to families, but also the collapse of cultural morality that roots in the relationship between land and people. The animated film Milky Way reimagines the story of the Weaving Maiden and Buffalo Herder to reflect the social reality of present-day China. Settings include the urban landscape of Shanghai, the fireworks ceremony at the Beijing Olympics Stadium, and the ruinous aftermath of the Sichuan Earthquake that was concurrent with the 2008 Olympic Games. 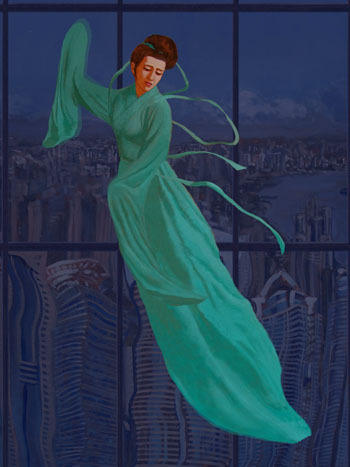 The short film Milky Way is composed of a series of original oil-paintings created by Lily & Honglei from 2009 to 2010. ©2008-2014 LILY & HONGLEI ART STUDIO. All Rights Reserved. 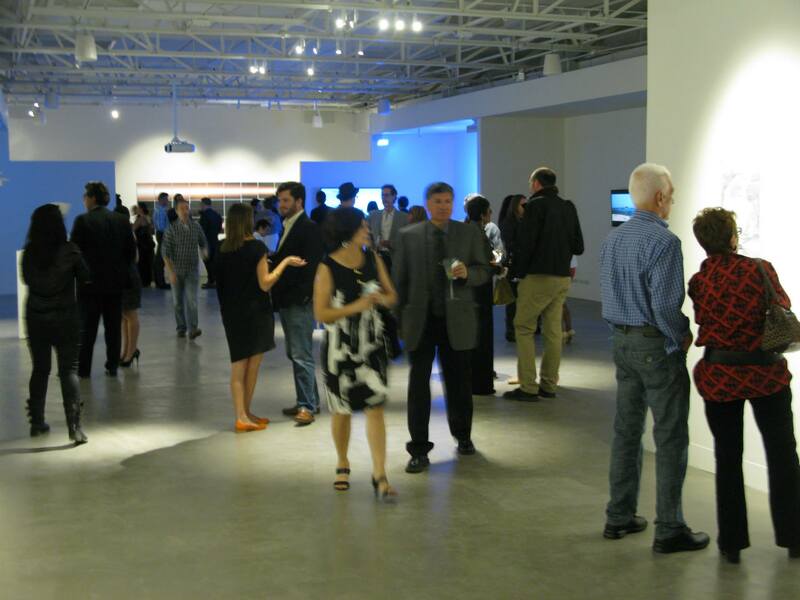 Preview Reception of ‘Satellite’ inaugural exhibition presenting new media art. Zhulong Gallery, 2014. 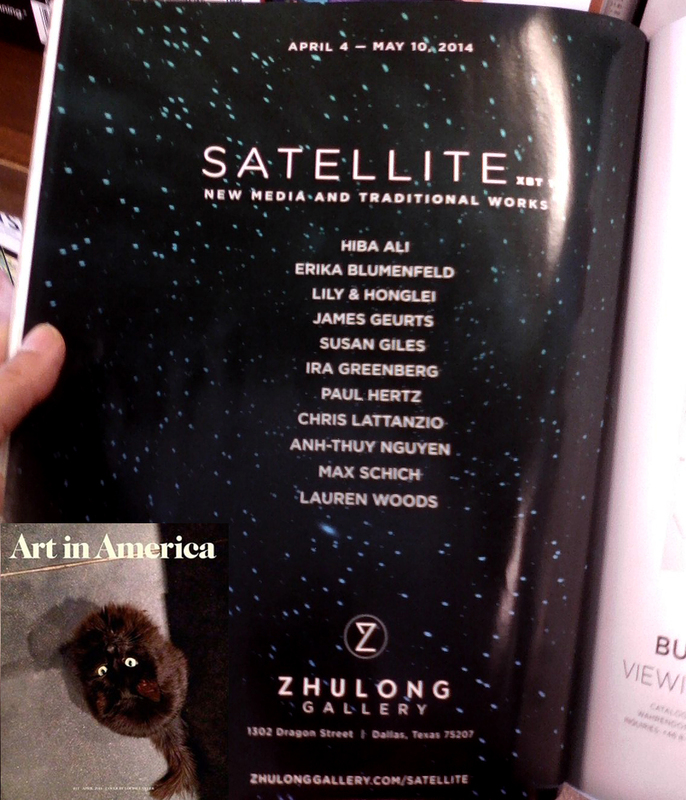 Preview night: new media art exhibition ‘Satellite’ at Zhulong Gallery. 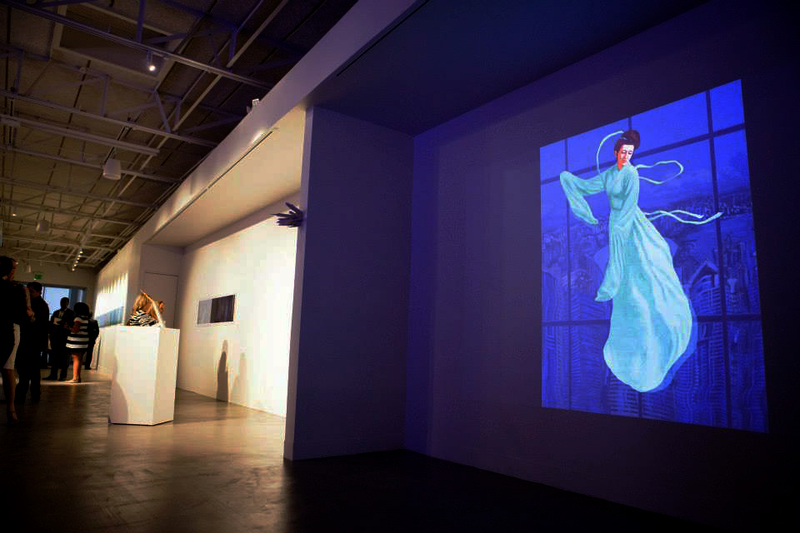 (Dallas, TX—March 11) Zhulong Gallery launches in Dallas on April 3. Designed to showcase New Media art, its multi-level galleries reclaimed from industrial space provide a high-tech platform for contemporary art. 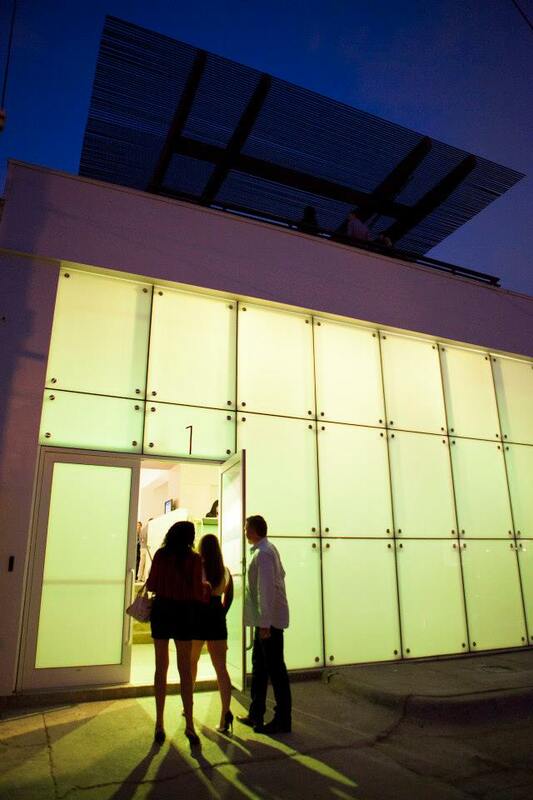 The gallery’s façade is a 17 x 10-foot screen for projecting images, text and video. Downstairs, the gallery space presents a museum-like setting that creates a sense of discovery for guests. Upstairs, a poetic gallery deck provides views of Downtown Dallas and the Margaret Hunt Hill Bridge. 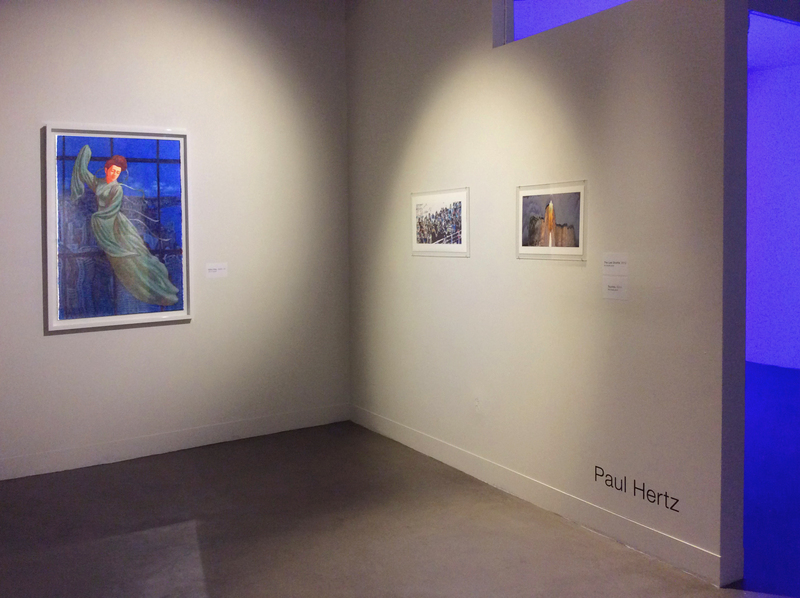 Exhibit continues April 4 – May 10, 2014. 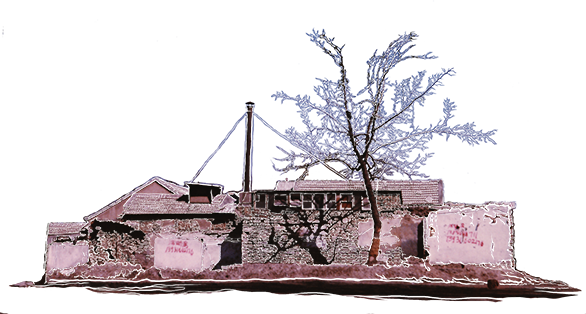 Beginning April 5, Zhulong Gallery will be open Tuesday – Saturday, 10 am – 5 pm or by appointment. 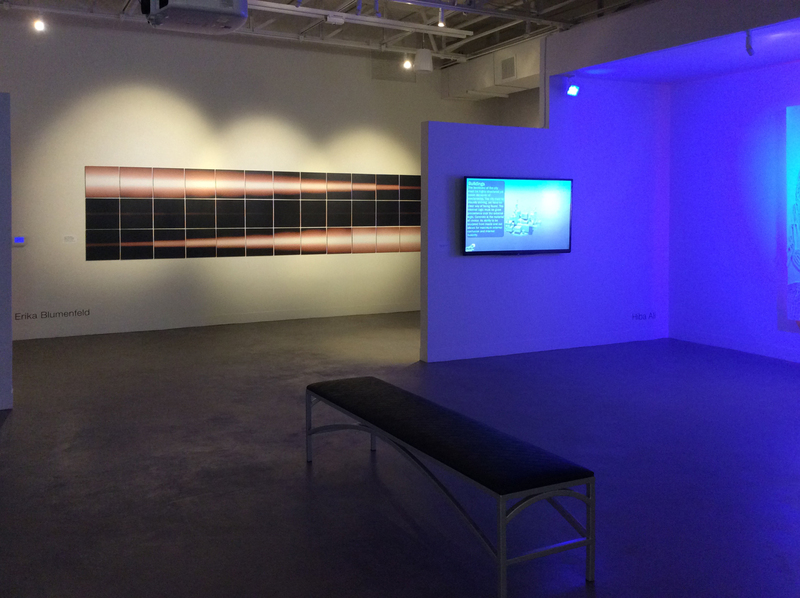 Satellite features New Media works by 11 contemporary artists and frames Zhulong Gallery as a hub for receiving and transmitting art and ideas. 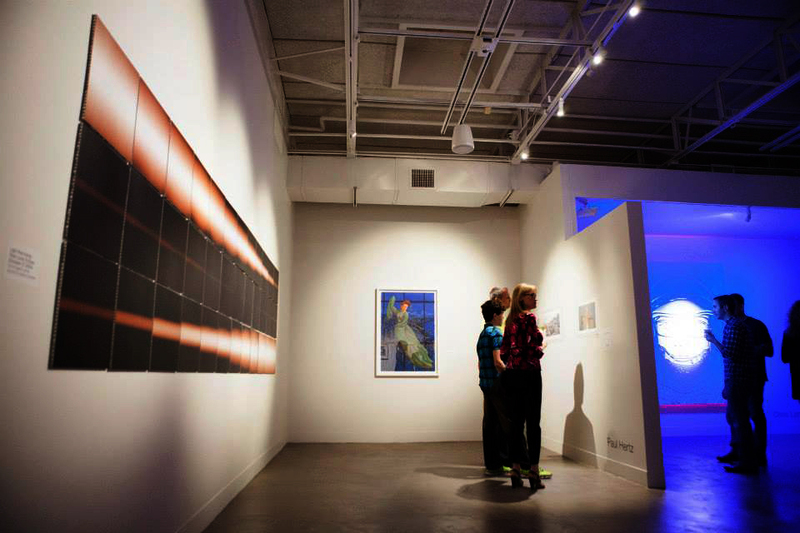 The artists interpret data, culture, travel, and time. Some of the works contain subject matter relating to space exploration and others hint at the satellite and its functions in an abstract, yet tangible manner. • Hiba Ali (b. Karachi, Pakistan, currently Chicago, IL) creates virtual environments and documents that explore power formations and alternatives to current Western infrastructures. • Erika Blumenfeld (USA) – With special devices, Blumenfeld records light and presents it as phenomenon in the form of installations, sound and video art, and artist books. 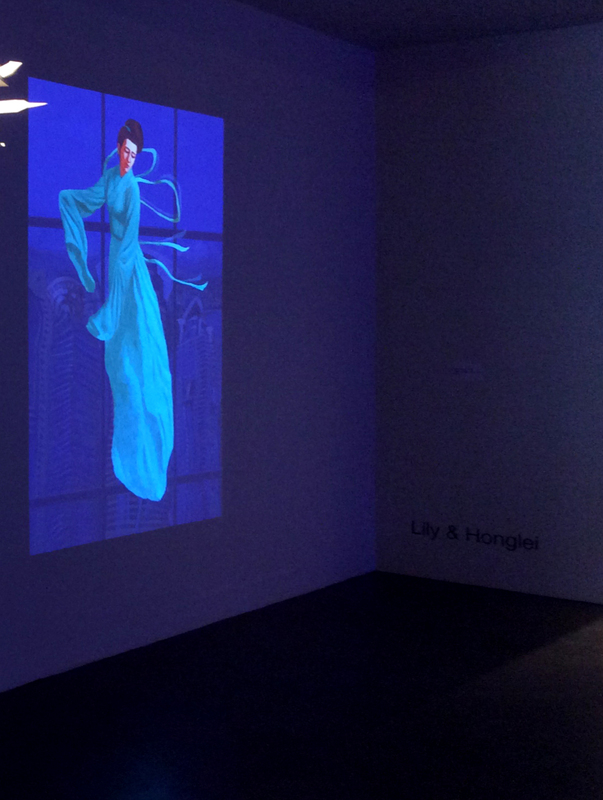 • Lily & Honglei (New York and Beijing) – This two-person collective meld the virtual and ‘real’, offering augmented realities (AR), video works, and virtual films communicating ideas about Chinese history and culture and its relationship to the globalized present. They are also members of the collective Manefest.AR, which uses mobile technology as strategy for visual art. • James Geurts’ (London, UK and Melbourne, Australia) ‘Expanded Drawings’ take an abundance of forms: public installations and sculptures, graphite drawings, projections and video works. All iterations convey the artist’s observations of specific geologic phenomena. • Susan Giles (Chicago, IL) presents architectural sculptures that relay the fragility and folly of memory. Working with spectacular and banal architectural forms and features, the artist creates large and small-scale sculptural works and video deal with transmission of experience into language—audible and gestural. • Paul Hertz (Chicago, IL) will present works from his latest series of glitch art, a program that visualizes the collapse of time and memory. • Chris Lattanzio (Dallas, TX) creates glowing relief sculptures and environments that play on Pop Art and render the banal and the spiritual with equal affect. Highly saturated or cool and atmospheric, the works alter both space and psyche. • Anh-Thuy Nguyen (b. Vietnam, currently Claremore, OK) is a performance and video artist who explores our significant cultural relationships with food in an attempt to present distinct but universal ideas. • Max Schich (Dallas, TX) culls massive data and interprets it into delicate visual representations. These info-pictures communicate trends, connections and disparities that might go unnoticed without this specific visual context. • Lauren Woods (Dallas, TX) is a conceptual artist working in hybrid media. Her ‘inkblot projections’ and other video, film and sound works set up alternative means and roles for viewing, the viewer and subject. 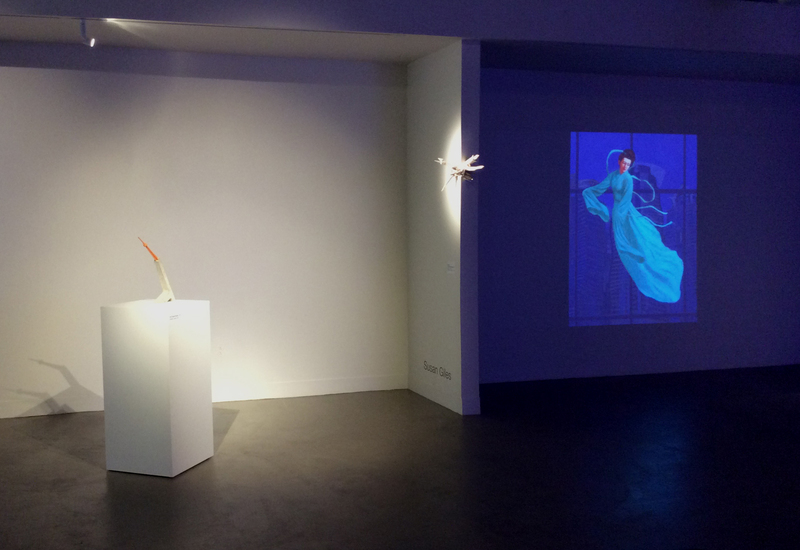 Zhulong Gallery: the new light on Dragon Street. More information is available at http://www.zhulongallery.com. 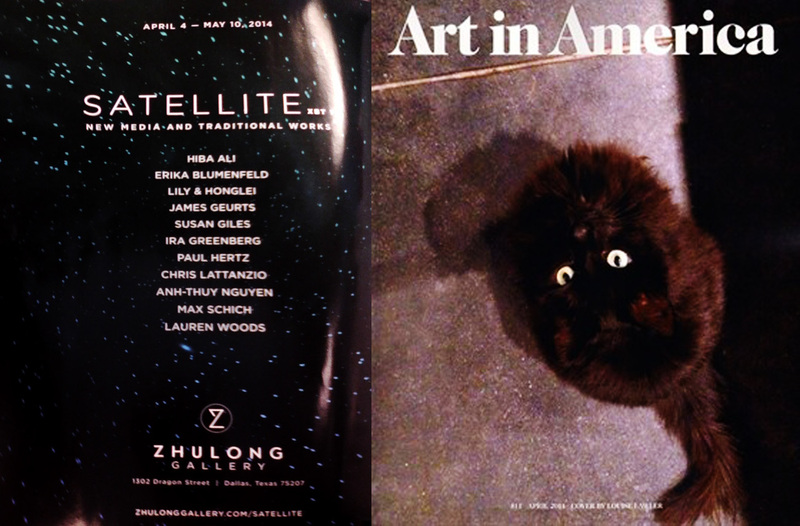 For more information regarding Satellite, please contact info@zhulonggallery.com.